The Ordinary Buffet + Copper Peptides 1% targets multiple signs of aging and improves overall skin health, supporting skin's collagen production and anti-inflammatory actions. 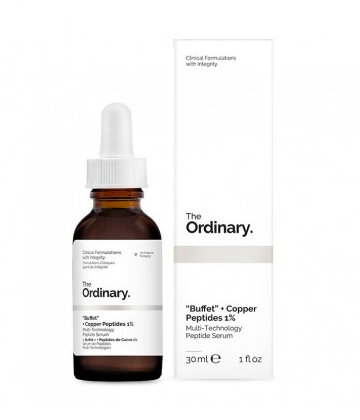 The Ordinary Buffet + Copper Peptides 1% differs from the original The Ordinary "Buffet" as this formula includes a 1% concentration of pure Copper Peptides, increasing its focus on overall skin health. The natural role of these peptides as found in human plasma includes supporting a wide range of skin health functions like maintaining normal immune function, collagen synthesis, fibroblast production and anti-inflammatory responses. The inclusion of Copper Peptides offers a natural blue tint to the formula. The total concentration of active technologies in this formula is 26.1%.